It is a state-of-the-art dental clinic, offering a wide range of services all under one roof such as facial cosmetic surgery, cosmetic dentistry, pain free treatment and the integration of facial beauty with dental beauty. HFD is equipped with advanced Hi-tech equipment’s and facilities like a spacious waiting area, well equipped doctor’s chamber with fully automatic dental chairs etc. We maintain a clean and safe environment and utmost importance is given to hygiene. HFD boasts of treatments like Cosmetic Dentistry, White Filling and Restoration, Gum Treatment, Root Canal Treatment and Crown and Bridge. What our patient says !! Dentist and the staff here are most helpful and make me feel very welcome at my appointment.I travel from Cambridge for any dental treatment I need because Dr.Tim is an excellent dentist and a really good bloke. Dentist did a really great job and is very patient and precise with his work from my experience. He is a calming and understanding person, and very thorough, direct and honest. I will definitely return in the future, and appreciate the service and value for money. Dr Loganathan has made my teeth and smile beautiful again. 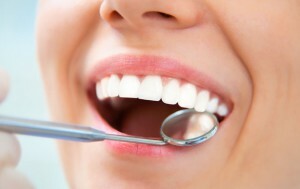 I am so happy to have found a wonderful dentist who is so nice and is very good at her profession. The pricing was extremely reasonable and I am delighted. Thank you so much. Great service. Watching them work on my son right now. The work was flawless, couldn’t be happier. A bridge is a fixed dental restoration (a fixed dental prosthesis) used to replace one or more missing tooth by joining an artificial tooth definitively to adjacent teeth or dental implants. A bridge will span the area where teeth are missing. They are attached to the natural teeth or implants that surround this space. The natural teeth or implants which support the bridge are called abutments. Depending on the type of bridge, natural abutment teeth may be reduced in size to accommodate the bridge to fit over them. An impression will be taken of the abutment tooth or implant and space to provide a mould to create the bridge. Using this, the bridge is then fabricated in a dental laboratory. Dental bridges can last five to 15 years and even longer. With good oral hygiene and regular checkups, it is not unusual for the life span of a fixed bridge to be over 10 years. It can be difficult to speak clearly when teeth are missing. 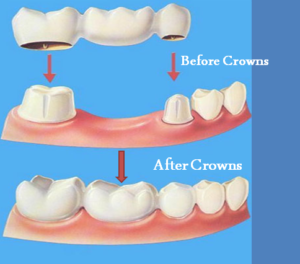 Wearing a dental bridge with the anterior teeth in their proper relationship will help you speak properly. During your routine checkup, we will have a look at any problem areas in your mouth. A metal probe with a small angled mirror will be used, which will help them see behind and between teeth and gums, as well as check for the softening of tooth enamel and dentin. Dentist will also be on the lookout for the swelling of gums in any areas, mouth sores, and redness. Finally, they will measure your mouth’s periodontal pockets, which are the spaces between the top of the gum line and where the gum tissues firmly attaches to the tooth. Ideally, this pocket should only be between one and three millimeters deep, however deeper pockets can be a sign of gum disease and thus should be closely monitored. We recommends digital x-rays, which emit up to 90% less radiation, allow for easy storage, and take less time than traditional machines – which means shorter, more convenient, and safer visits for you! 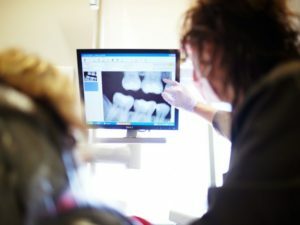 The Dentist will use your dental x-rays to see if there is any loss of bone, fractures, or any other abnormality below your visible gum line before moving on to look for issues with jaw alignment, teeth grinding, and oral cancer. Teeth naturally discolour over time and with age. Discolouration may also occur due to exposure to tea, coffee, red wine, tobacco and certain foods, childhood illnesses, medications and physical trauma. Cheaper and convenient take home teeth whitening kit. On your first visit – one of our Dentists takes an alginate impression to make a custom dental tray. Once this process is finished the impression is sent to labarotary. Within days, your complete whitening kit will be ready to be collected. Your kit contains two new custom- made trays (one for the top teeth and one for the bottom), syringes of whitening gel and easy-to- follow instructions. Once home, apply a small drop of gel inside each tooth impression in your two trays, place on your teeth, then relax over the next few hours. After this procedure, remove and rinse your trays, and brush your teeth. Repeat this over the next week or two until you achieve the level of whitening you desire. What is a Cleaning and Polish? To reduce the risk of gum disease or to help stop it from becoming more serious, your dentist may recommend that you have a professional clean, called a scale and polish, to get your teeth properly clean. What to expect at a scale and polish? The next step is to ‘polish’ the teeth to make the surface really smooth. 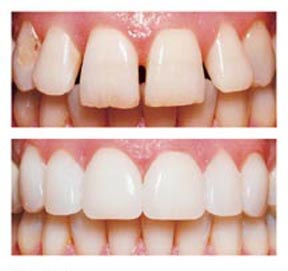 While polishing removes stains leaving teeth bright and shiny, it is not just a cosmetic procedure. It also smoothes away minor imperfections and patches of rough texture on the teeth to protect against further plaque build up. Your dentist will advise you how often you should have a scale and polish. It’s important to remember that professional cleaning is an addition to a good daily oral health routine, and should never replace twice daily brushing with a fluoride toothpaste. A tooth extraction is the removal of teeth from the dental alveolus (socket) in the alveolar bone. Extractions are performed for a wide variety of reasons, but most commonly to remove teeth which have become unrestorable through tooth decay, periodontal disease or dental trauma, especially when they are associated with toothache. Root canal treatment is an often straightforward procedure to relieve dental pain and save your teeth. Patients typically need a root canal when there is inflammation or infection in the roots of a tooth. During root canal treatment, the dentist carefully removes the pulp inside the tooth, cleans, disinfects and shapes the root canals, and places a filling to seal the space.